What is the Schwinn Airdyne Exercise Bike? The Schwinn Airdyne Bike is a fantastic exercise fan bike that has been around since the 80s! 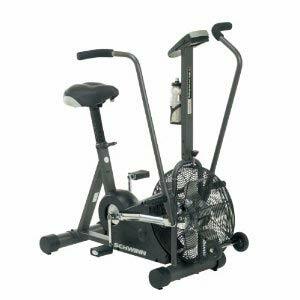 The Schwinn Airdyne bike is an upright stationary exercise bike with handles. Also known as fan bikes or dual action bikes, the resistance is provided by a fan wheel that exponentially increases resistance from wind the harder you pedal. The intensity of exercise on the Airdyne bike is completely dependent on the person exercising. You can either exercise your lower and upper body at the same time, just your legs, or exercise your arms independently simply by resting your feet on pegs in the center of the fan wheel. The best part about the Schwinn Airdyne is what you get for your money when considering features, performance, and warranty. With the purchase of an Airdyne bike from Schwinn you get up to a whopping 30 year warranty (some models) on the frame for residential or commercial use. For example, the hugely popular and very affordable Airdyne AD6 offers the following warranty: Frame – 15 yrs; Parts – 3 yrs; Electrical – 2 yrs; Labor – 6 mos. You will find that most competitors offer a paltry 1 year warranty on the frame and other components. Airdyne bikes seldom need any maintenance and almost never break down, a testament to their build quality. Their best in class warranty is an added piece of mind bonus too! If you want a cardio machine that will give you a tough workout for life, the Schwinn Airdyne bike is a tremendous value for the money. Who can Benefit from Using the Schwinn Airdyne Bike? Being a cardio machine first and foremost, the Airdyne cardio bike is primarily used for anyone looking to burn calories, lose weight or tone up, as well as people looking for cardiovascular performance and high intensity intervals. Where the Airdyne bike excels is when it is part of a cross training program where high intensity aerobic and aerobic exercise is the goal of training. While the Airdyne bike is not meant to be a substitute of resistance (weight) training, it can be used to train the anaerobic systems. People using it for this reason should not expect huge muscle gains in their upper body but they also have no reason not to expect some small muscle gain and/or muscle toning in the chest, triceps, lats, shoulders, biceps, and forearms from using the handles. Almost anyone can get the benefits of cardiovascular exercise on the Schwinn Airdyne. It should be noted that even people missing a limb can still use the Airdyne to exercise the other 3, and they will also of course get the cardio benefits out of it. Small children or little people who cannot reach the pedals or handles are the only people who cannot benefit from using the Airdyne bike. As mentioned previously, before you consider purchasing this wonderful piece of fitness equipment, keep in mind that the intensity of exercise on the Airdyne bike is completely dependent upon you, the person exercising on it. Is Schwinn Airdyne Bike Good for a Home Gym? The Schwinn Airdyne Bike is an excellent addition for any home gym! The Schwinn Airdyne bike is a great addition to most people’s home gym. If you consider the cost and durability (usually last for decades with very little maintenance) the Airdyne bike is one of most cost effective pieces of home gym fitness equipment you can buy. Before considering an Airdyne bike, you should consider the motivation factor. Since the workout you get on an Airdyne bike is completely dependent upon the effort you put in (unlike treadmills for example which are moving so you have to keep up) if you are one of those people who give up easily and need extra motivation, you may be better off with a machine that controls tempo and/or intensity levels. The only physical drawbacks of the Schwinn Airdyne bike for your home gym is the fan and the noise. While the fan is nice because it is constantly blowing at during exercise, cooling you off, it can be an annoyance if there is anything in the immediate area (such as desk cluttered with papers) which can be disturbed by airflow. The Schwinn Airdyne bike also makes quite a bit of noise. The harder you push, the more noise the Airdyne bike will make so take this into consideration if you have to be quiet where you plan to use the bike. The slightly more expensive Evo Comp Exercise Bike produces a bit less noise than the standard version with little added cost. Is the Schwinn Airdyne Bike Good for the Commercial Gym Setting? Let’s face it, the cardio machines which are popular with commercial gym users are seldom the most effective. There is no coincidence that the Schwinn Airdyne bike is seldom found at commercial gyms. Since commercial gyms choose cardio machines that wow prospective members over effective machines, the Airdyne bike will likely collect dust in a commercial gym. Some commercial gyms also may not like the fan blowing around their gym or the noise the Schwinn Airdyne exercise bike produces either. How is Schwinn Airdyne Bike for Personal Trainers? Personal trainers and strength & conditioning coaches have always loved be Airdyne Bike! There is a reason why most athletic training centers and serious personal training studios have a Schwinn Airdyne bike. Since in most of the aforementioned settings, time is limited, the Schwinn Airdyne bike’s concurrent upper and lower body exercise is perfect for warm ups, cool downs and high intensity cardio or anaerobic intervals. Personal trainers and strength & conditioning coaches are there to motivate their clients to the maximum. One of the few drawbacks to the home gym use of the Airdyne bkee is having the motivation for people to push themselves to the proper intensity to get the most out of a workout. With a trainer or coach pushing you, this is never an issue for personal trainers using the Airdyne bike as part of their training sessions. An added bonus for small personal training studios and trainers who train out of small space is the cost effectiveness of the Airdyne bike as it will be as good as new through years of heavy use, and seldom needs maintenance to keep it performing optimally. How do you exercise on the Schwinn Airdyne Bike? There is nothing complex about using the Schwinn Airdyne exercise bike. There are pedals for your feet and handles for your arms which are connected. As you pedal the bicycle the handles move forward and backwards. You can either choose to pull and push the handles with both your arms as you pedal, just pedal without pulling and pushing the handles, or just pull and push the handles for an upper body workout as you rest your feet on the pegs. As stated in the introduction, the harder you pedal and push-pull, the harder the resistance becomes. 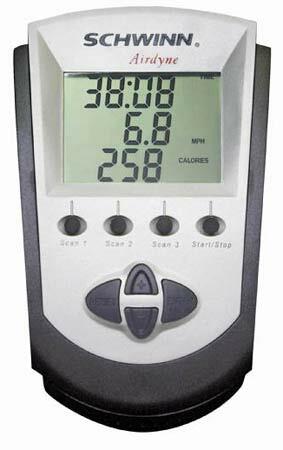 It is up to you to adjust your intervals based on the time, distance, workload level, calories burned, calories per hour, heart rate, and RPM which are provided by the computer readout panel on the Airdyne Bike. Since you can use both upper and lower body push-pull muscle groups at the same time, exercising on the Airdyne bike properly can cut the time you spend performing cardio so you can either exercise less or exercise the same as with many other cardio machines and get the same results. Where can I buy the Schwinn Airdyne Bike? If you’re looking for a new Airdyne exercise bike, you can find them on numerous fitness equipment vendors online for prices which are often below retail price. However, one of the best places to pick up a Airdyne Bike is at a fitness equipment convention. If you happen to find one is coming to your local area, you are likely to get a really good price there. But while conventions are almost always one of the best places to buy discounted fitness equipment, this option isn’t exactly a practical one for most of us. For most of you, online is going to be your go to place to purchase an Airdyne. Thankfully all popular models including the Schwinn Airdyne Bike AD PRO, AD6, and AD2 are available from most online vendors. Some vendors continue to offer the Airdyne AD4 and Evo Comp as well. Check out the following links below to find discounts on the most popular models and some comparable dual action fan cardio bikes. Schwinn Airdyne exercise bikes are still among the highest quality exercise bikes available today. With a strong past and a strong present in terms of build quality, cardiovascular workout potential, warranty, and pricing, Schwinn Airdyne bikes will be a great addition to just about any home and even some commercial gym settings. But while they aren’t necessarily going to be the best option for everyone, you really can’t get a much better cardio workout, especially from an exercise bike.